static const CHAR testcallbackA  = "callback"
Definition at line 30 of file tooltips.c. Definition at line 107 of file tooltips.c. Definition at line 105 of file tooltips.c. Definition at line 106 of file tooltips.c. Definition at line 104 of file tooltips.c. Definition at line 103 of file tooltips.c. Definition at line 101 of file tooltips.c. Definition at line 102 of file tooltips.c. Definition at line 100 of file tooltips.c. Definition at line 108 of file tooltips.c. Definition at line 32 of file tooltips.c. Definition at line 865 of file tooltips.c. Definition at line 341 of file tooltips.c. Referenced by test_gettext(), and test_TTN_SHOW(). Definition at line 110 of file tooltips.c. Definition at line 82 of file tooltips.c. Referenced by test_customdraw(), test_setinfo(), test_track(), and test_TTN_SHOW(). Definition at line 921 of file tooltips.c. Definition at line 277 of file tooltips.c. Definition at line 322 of file tooltips.c. Definition at line 1236 of file tooltips.c. Definition at line 40 of file tooltips.c. Definition at line 149 of file tooltips.c. Definition at line 351 of file tooltips.c. 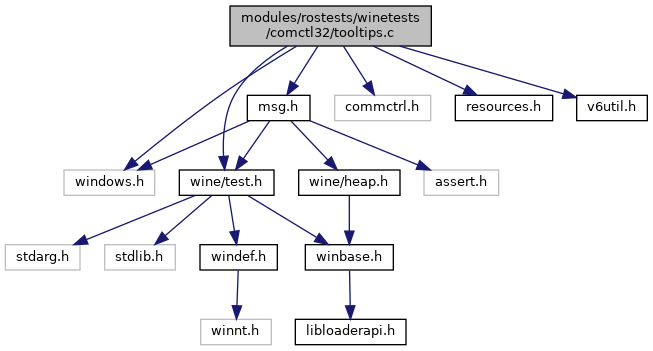 501 /* Wine currently checks for V3 structure size, which matches what V6 control does. Definition at line 747 of file tooltips.c. 750 "According to MSDN, TTM_ENUMTOOLS claims that TOOLINFO's lpszText is maximum "
Definition at line 803 of file tooltips.c. 806 "According to MSDN, TTM_ENUMTOOLS claims that TOOLINFO's lpszText is maximum "
Definition at line 1070 of file tooltips.c. Definition at line 935 of file tooltips.c. Definition at line 870 of file tooltips.c. Definition at line 1107 of file tooltips.c. Definition at line 549 of file tooltips.c. Definition at line 1185 of file tooltips.c. Definition at line 97 of file tooltips.c. Referenced by custom_draw_wnd_proc(), and test_customdraw(). Definition at line 96 of file tooltips.c. Definition at line 98 of file tooltips.c. Definition at line 276 of file tooltips.c. Definition at line 38 of file tooltips.c. Referenced by parent_wnd_proc(), START_TEST(), and test_TTN_SHOW(). const CHAR testcallbackA = "callback"
Definition at line 274 of file tooltips.c. Referenced by parent_wnd_proc(), and test_gettext(). Definition at line 1179 of file tooltips.c.